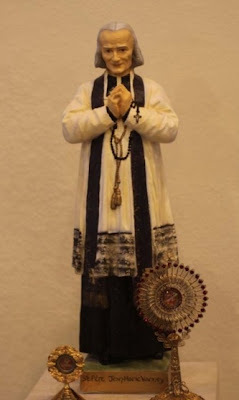 As the global church celebrates the Year of the Priest, Tuesday saw the 150th anniversary of the death of St John Vianney, the patron of parish ministry who'll be proclaimed patron of all priests over the course of the yearlong observance. While the Pope dedicated the catechesis at his General Audience yesterday to the saintly Cure d'Ars, at least three Stateside bishops took advantage of the feast to send messages to their priests: Bishop Thomas Tobin of Providence mailed his, Bishop John Barres of Allentown (Chrism still fresh on his head) followed up the impressive, extensive "inaugural address" given at the close of his ordination last Thursday with a seven-page, well-footnoted pastoral on Vianney to his presbyterate 24 hours later, and on his fourth anniversary at the helm of the quickly-growing church in eastern North Carolina, Bishop Michael Burbidge of Raleigh celebrated a special Vianney Day Mass in Sacred Heart Cathedral, using the occasion to "speak directly" to his priests. Speaking of the latter, anyone curious for a look-in on what a (high) priest's day is like might enjoy checking what a Triangle TV station found when it trailed the Burb as he cris-crossed his 54-county, 32,000 square-mile turf, its 200,000-plus Catholic population more than tripled since 1990.